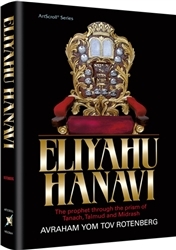 Few nevi'im (prophets) are as well known as Eliyahu HaNavi. He is a figure not only of the past, but also of the present and future. Even after ascending to heaven, he continues to advocate on behalf of his nation. A seat of honor is set for him at every bris milah and a cup named for him is poured at the Seder. He will be Hashem's messenger to herald the coming of Mashiach. All this is true, but it is not nearly a complete picture of the prophet whose exploits are spread over seven chapters of the Book of Kings. With incredible courage he opposed the evil King Achav and his villainous Queen Izevel. Achav flooded the Ten Tribes of Israel with Idolatry and Izevel ordered the slaughter of every prophet of Hashem, and would have done the same to Eliyahu had Hashem not carried him to safety. Though Eliyahu sharply admonished Israel for its sins, his love for them was as great as his anger, and he helped them whenever he could. In one of the most inspiring episodes in all of Tanach, Eliyahu brought hundreds of thousands of Jews to Mount Carmel and proved to them that the prophets of Baal were charlatans. United, the entire multitude proclaimed, "Hashem - He is the G-d! Hashem - He is the G-d!" Finally, when Eliyahu's mission on earth was complete, Hashem took him up to heaven in a whirlwind. Who was Eliyahu? How can we understand his zealotry? What was his mission? How was he unique? What is his legacy for us? The Sages in the Talmud and Midrashim, the commentators on Tanach, and the classic Torah works are filled with descriptions and discussions about Eliyahu. In this magnificent volume Avrohom Yom Tov (Abie) Rotenberg scours the classic literature to bring us an unprecedented picture of Eliyahu and his mission. Rabbi Rotenberg cites the verses in Tanach and explains them. And he delves deeper and broadens the portrait based on the major commentators. Nowhere is there such a complete picture of the prophet and an analysis of his words, deeds, and period. To read this beautiful and profound volume is to informed, inspired, and uplifted.